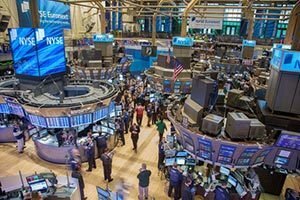 Expect a volatile Dow Jones Industrial Average today as some high-profile companies reported mixed earnings and Wall Street makes sense of the Apple settlement. The Dow is already in the red despite a hot start from Morgan Stanley (NYSE: MS) this morning. Plus: Apple's settlement was a big winner for one stock (and it wasn't Apple). Earnings season is off to a bit of a rocky start. Investors are concerned about global economic growth and whether the red-hot markets of 2016 to 2018 are ready to slow to a crawl. Expectations are not high for the first quarter, as banking and retail stocks can't seem to break out. But there's another sector where problems are mounting even worse. And we have a simple profit play to get you started ahead of next week's schedule. Today, Morgan Stanley headlines a busy day of earnings reports. Shares of MS stock added 2% in pre-market hours and boosted the DJIA, thanks to a strong first quarter for the investment bank. Executives said the bank earned $2.4 billion in profit last quarter, or $1.39 per share. That figure beat expectations. Total revenue came in higher than expected at $10.3 billion. The bank cited stronger fixed-income trading and wealth management revenue for the gain. The deal might be off again between Sprint Corp. (NYSE: S) and T-Mobile US Inc. (NYSE: TMUS). Shares of Sprint plunged more than 10% thanks to news that the Department of Justice is pushing back on the proposed merger due to antitrust concerns. The DOJ is unlikely to approve the deal as it is currently structured, according to various media outlets. TMUS shares were off 5% on the news. Netflix Inc. (NASDAQ: NFLX) stock was falling since the company reported earnings after the bell Tuesday. The streaming giant issued weak forward guidance and raised concerns about its continued subscriber growth. Shares fell as much as 8% even though the firm topped Wall Street earnings and revenue expectations. However, the firm said it expects earnings in the second quarter to come in at $0.55, well below the consensus expectation among Wall Street analysts (at $0.99). Shares of QUALCOMM Inc. (NASDAQ: QCOM) rallied more than 23% in Tuesday's trading session and popped another 10% this morning on news it had struck a royalty deal with Apple Inc. (NASDAQ: AAPL). QCOM stock received multiple upgrades from Wall Street banks after Apple agreed to pay the company an undisclosed amount to settle a long-time legal dispute over royalties and patents. The deal suggests that QCOM will sell semiconductor chips to Apple moving forward. The revolution is here. On April 3, Verizon Communications Inc. (NYSE: VZ) introduced the nation's first 5G network services in Chicago and Minneapolis, kicking off one of the most explosive tech investing opportunities we've seen. And VZ stock is just getting started. Today, look for more earnings reports from WD-40 Co. (NASDAQ: WDFC), Bed Bath & Beyond Inc. (NASDAQ: BBBY), and MSC Industrial Direct Co. Inc. (NYSE: MSM). 5G Could Mint a New Wave of MILLIONAIRES! It's the greatest tech shift in generations, and it can create untold wealth for investors. If you ignored weed or crypto – DO NOT miss out again. This could be your LAST shot at early retirement. Find out how you could capture a life-changing SIX-figure windfall from 5G right now.